Be prepared to cook hot, wholesome meals in an emergency, or simply stock your pantry for your family's everyday dining. Delicious with our homemade noodles - see below for a great recipe to try! Need more than a few cans? Buy a case of 12 (#12291201) and save! CRUST: Combine 3/4 cup flour, baking powder and salt. Cut in butter until crumbly. Add buttermilk and oil. Mix well. Gradually add water until dough forms a ball. Cover and refrigerate 1 hour. This is the best canned chicken we have ever had!! Makes the best chicken salad and chicken and noodles. Our first case mostly was given to friends and family to show them how great it is...I had to order another case. Excellent. Except I wish it came in a smaller can. Maybe half the size. This chicken is BETTER than what you get in the store, canned, or fresh. I have never eaten any chicken from the store, this good, in years. I will be purchasing this for ALL of my chicken needs from now on. Nothing comes close to it's quality and flavor. Finally, chicken I will enjoy eating again! Thank you Lehman's. I HATE the regular canned chicken you can get a Sams. I have actually thrown out a casserole that a friend brought after surgery. Had no idea what to do for canned chicken to stock until I found this. What a God send...literally. Once again Lehman's comes thru! 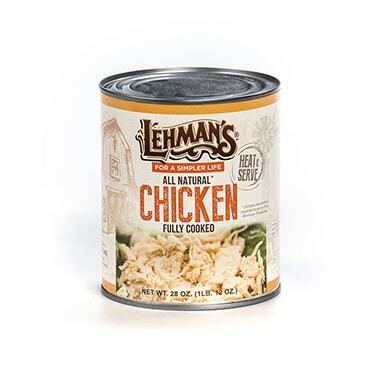 This is a wonderful canned chicken. 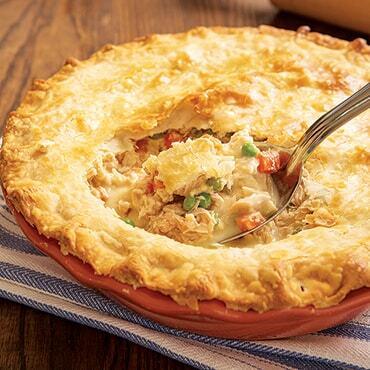 I used it in a casserole dish, everyone loved it.The chicken is very tasty and is to use. I will be buying it again. Fantastic. Tonight I made chicken curry and everyone gave it a big thumbs up. I saved the liquid to make soup. I am going to buy another case so we're prepared for anything - though we hope we never see another storm like Sandy! I ordered one can to see if I liked it. I did not like it I LOVED it! Tastes great and so easy! Fixed it with your wide noodles and yum yum! Thank you! I am ordering a case now!! Great product! 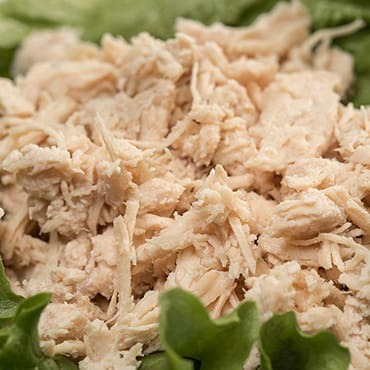 The chicken is white meat, and the chunks of meat are large (about 2 inches wide). I was able to get two generous sandwiches (if you made chicken salad out of it, you could get twice that), and I used the rest of the meat and the liquid from the can to make a great pot of chicken soup (three large servings). The meat tastes like home-canned chicken, and the liquid and fat from the can made a good soup stock. I'll definitely buy more of these! I am known as the casserole queen in my family. Having grown up as the oldest child and only sister with three brothers, casseroles were a way to stretch Mama & Daddy's dollars. Now that I am in my fifties and a grandmother, it is so nice not to have to cook the chicken before I turn it into a casserole. These cans are full of delicious chicken, but there is enough broth to use in the casseroles to add delicious flavor. I also bought the beef, turkey, and pork canned meat too. Lehman's, you have a winner here! With winter (and power outages!) coming, this will be a godsend! Thank you so much! You have the most wonderful products out there!